Problem installing or launching Fractal Mapper, AstroSynthesis, or other NBOS program? Getting a malware warning? If the program won't launch, you are receiving a malware warning, or you are receiving error messages from Windows about missing components, make sure your anti-virus software is not incorrectly flagging or blocking the programs. You may want to create an exception for the program within your anti-virus software. Our installers are digitally signed to prevent tampering. To confirm that the file has not been modified, you can check the signature. 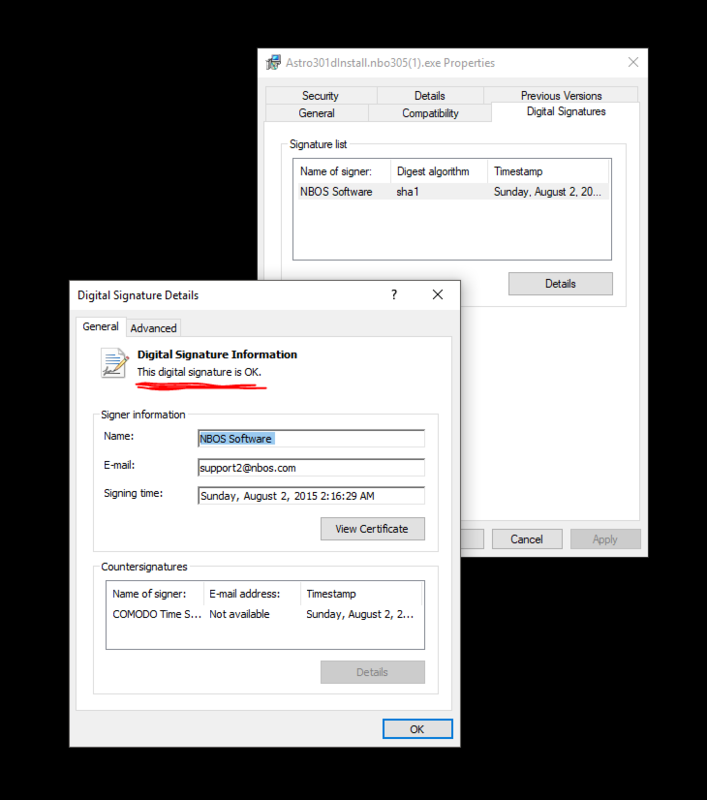 To do this, right click on the installer's name in File Explorer, and select properties, and then the Digital Signatures tab. Select the signature in the list, and press Details. For a list of Frequently Asked Questions, you can follow this link to view the NBOS Wiki. If you're getting a "License File Missing or Incorrect" error message or your Fractal Mapper fills have a red tint, this is the place to check. You can join and post your questions to the NBOS Forums. This is the best option when looking for advice on using the software. Bug reports should not be sent to the list. Please check that you're running the latest update for your software. Use Help -> Check for Updates from the program's menu. Updates can also be found in the program updates section of NBOS Online Exchange if the version of your program does not have a built in update checker. Each update on the download page will list the bugs fixes and enhancements in that update. Please note: The more information you give us, the better we can help. Please be sure to include a full description of the problem, and where applicable, the steps to duplicate the problem.